Electricians carry out work primarily on the wiring and electrical installation, although the work does extend to other areas such as cabling for telephone, TV, Sky, surround sound, alarms and the like. Electricians and electrical contractors should be members of either of the two regulatory bodies for Ireland, RECI the Register of Electrical Contractors of Ireland or ECSSA Electrical Contractors Safety & Standards Association. 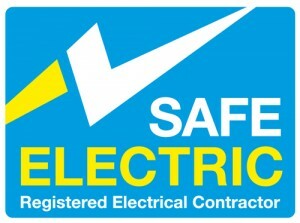 A new scheme has been launched called Safe Electric this is to inform the public about the importance of using only Registered Electrical Contractors and that the client should receive a completion certificate. Every time an electrician carries out work on an electrical installation a certificate should be handed to the client. When carrying out renovations or new building works it is best to seek the advice of your electrician before your plaster starts as it will be best to conceal the wiring. Very often we don’t think of all the work that goes on behind the wall, the switch or socket on the wall has a cable/cables running from the switch or socket all the way back to the position where the fuse board/consumer unit is fitted. This is the same for all electrical outlets and appliances so it makes sense to think about this before it’s too late.